As with so many cat breeds, little is known of the Russian Blue’s origins. He probably does come from Russia—his thick coat is surely that of a cat from colder climes—and he is considered a natural breed, meaning Matushka Nature created him, not the handiwork of humans. The Russian Blue’s development as a breed, however, took place primarily in Britain and Scandinavia, starting in the late nineteenth century, when showing and breeding cats became a popular activity. The Russian Blue made his first appearance on the world stage of the cat fancy at an exhibit of cats held at London’s Crystal Palace in 1875. Labeled an Archangel Cat, because he was said to be from the Russian island of Archangel, he competed against other blue cats of varying types. A newspaper report of the show described the Russian Blue as “very handsome” and “particularly furry,” adding “They resemble mostly the common wild grey rabbit.” Other early names by which the breed was known were Maltese and Foreign Blue. A British cat fancier named Mrs. Carew-Cox began importing the cats in 1890 and bred and showed them through the turn of the century. She described them as having short, silvery fur, large ears, wide-set eyes and lean faces, with sweet, intelligent personalities—in short, much the same as the Russian Blue of today. In 1912, the cats were well enough established that they could be shown in a class of their own instead of being lumped together with other blue cats. World War II nearly put an end to the breed. Very few cats survived the years of privation, and British and Scandinavian breeders turned to other breeds, primarily the Siamese and the British Blue, to help revive their bloodlines. Because of the Siamese influence, the cats developed a more extreme look, and the texture of their coat changed. It took years to bring the breed back to its original appearance. That was achieved by combining British bloodlines, which emphasized plush, silvery coats, and Scandinavian bloodlines, which were known for producing cats with bright breen eyes and flat profiles. The result was the Russian Blue of moderate type seen today. Russian Blues were first imported to the United States in 1900, but it wasn’t until after World War II that American breeders began to develop their own lines from cats imported in 1947. Today they are popular show cats as well as companions to those who know the secret of their sweet beauty. The Russian Blue has a reputation as a gentle, quiet cat, somewhat shy, but don’t get the wrong idea. This cat may have a reserved nature, but he loves to play (being especially fond of retrieving) and enjoys jumping or climbing to high places where he can study people and situations at his leisure before making up his mind about whether he wants to get involved. Guests will not receive his immediate attention and may never see him unless he decides they are worthy of his notice, but toward family members, especially his favored person, he is ever loyal, following them through the house and even riding on a shoulder. The Russian Blue is a sensitive cat who doesn’t like to be ignored and will be hurt if he doesn’t receive the same amount of affection he gives. Lack of attention can cause him to become anxious or fearful. While the Russian Blue loves your company, he is capable of entertaining himself during the day while you are at work. Unlike some active, intelligent breeds, he is not destructive but moves through the house with the lithe grace of a Russian ballerina. When you are at home, his subtle sense of humor and manual dexterity will never fail to entertain. Just make sure you laugh with him, not at him. He has a strong sense of self-worth and doesn’t like being made fun of. This is a cat who does best in a quiet, stable environment. He doesn’t like change, and it’s especially important to him that meals arrive on time. Count on him to be a faithful alarm clock in the morning, not so you don’t miss work but so he doesn’t miss a meal. If you take the time to develop a relationship with a Russian Blue, your reward will be a deep bond with this loving cat. Both pedigreed cats and mixed-breed cats have varying incidences of health problems that may be genetic in nature. The Russian Blue is generally healthy, however. An owner’s main concern will probably be this cat’s hearty Russian appetite, which can turn him from sleek to stout in no time. The Russian Blue’s dense coat should be combed twice a week to remove dead hair and distribute skin oils. Brush the teeth to prevent periodontal disease. Daily dental hygiene is best, but weekly brushing is better than nothing. Trim the nails every couple of weeks. A bath when the cat is shedding will help to remove excess hair more quickly. Keep the Russian Blue’s litter box spotlessly clean. He is very particular about bathroom hygiene. It’s a good idea to keep a Russian Blue as an indoor-only cat to protect him from diseases spread by other cats, attacks by dogs or coyotes, and the other dangers that face cats who go outdoors, such as being hit by a car. Russian Blues who go outdoors also run the risk of being stolen by someone who would like to have such a beautiful cat without paying for it. The Russian Blue’s elegant yet muscular body led one cat judge to proclaim him the “Doberman Pinscher of cats.” He has what’s called a semi-foreign body type, meaning it is moderate in shape, falling somewhere between the short, compact body of breeds such as Persians and the sleek angles of Oriental breeds such as the Siamese. The Cat Fanciers Association breed standard for the Russian Blue calls for him to have a head that is a smooth, medium-size wedge shape with a blunt muzzle. The broad wedge of the head and its flat skull are often described as cobra-like, although that is much too dangerous a description for this sweet-natured cat. Regal is perhaps a better term. Large ears are wide at the base with pointed tips, the interior lined with thin, translucent skin, and rounded vivid green eyes are set wide apart. A long, slender neck segues into high shoulder blades and a fine-boned body that is firm and muscular, covered with a short, thick double coat with a plush texture, often described as similar to that of a seal or beaver. If you were to run your fingers through a Russian Blue’s coat, the patterns they made would remain until they were petted smooth. The body is supported by long, fine-boned legs set on small, slightly rounded paws with pads that are a pinky lavender or mauve shade. The tail is long but in proportion to the body. The Russian Blue stands out for his coat color. To the uninformed, he might look gray, but in cat show terms he is an even, bright blue with silver-tipped hairs that make him seem to glisten. Some Russian Blue kittens are born with “ghost stripes,” a reminder of the tabby gene that all cats carry, even if it isn’t expressed in their coat, but these generally fade, leaving the cat with the solid blue coat of maturity. 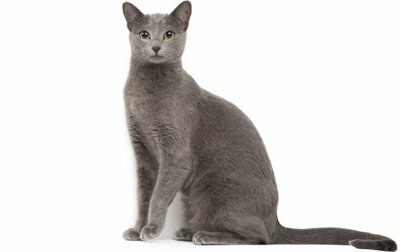 You might think that a Russian Blue would only come in blue, and in CFA that is true, but other cat associations have more liberal breed standards. In Australia and New Zealand, the cats are called “Russians” and come in white and black as well as the traditional blue. The American Cat Fanciers Association permits black Russians. Russian Blues have a tolerant nature toward children who treat them kindly and respectfully. They will even put up with the clumsy pats given by toddlers, as if they recognize that no harm is meant, and if necessary they will walk away or climb out of reach to escape being bonked on the head. That said, the patient and gentle Russian Blue should always be protected from rough treatment, so always supervise very young children when they want to pet the cat. The Russian Blue is also accepting of other animals, including dogs, as long as they aren’t chased or menaced by them. Introduce pets slowly and in controlled circumstances to ensure that they learn to get along together.